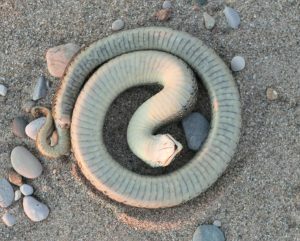 As recently as 2011, a new population of Eastern Hog-nosed snakes was reported near Goderich. This was an exciting discovery, as Hog-nosed snakes are currently listed as a Threatened species in both Ontario and Canada, and because this is the only known population in Huron County. The Huron Stewardship Council has been working to learn more about this snake, and will be collaborating with Laurentian University on a new research project beginning spring 2018. 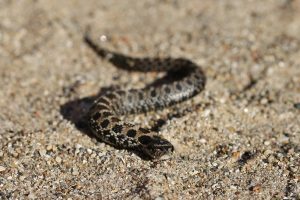 The shovel-like upturned nose of the Eastern Hog-nosed snake allows it to dig in sand to find toads, its favourite food. The main goals of the project are to identify the threats to Eastern Hog-nosed Snakes and their habitat, to determine the size of the population, and to better understand habitat use and movement of these snakes. These efforts will assist with recovery and protection of the species and their habitat, and will promote protection of biodiversity in Huron County. The Eastern Hog-nosed Snake is a harmless, non-venomous snake with a flair for drama and taste for toads. When it feels threatened, this snake will flatten its head and neck like a cobra, often hissing and mock-striking. It may then flip on its back to play dead. Despite this impressive performance, this snake is completely harmless to humans and pets. Hog-nosed snakes come in many colours but are often grey, yellow, brown, olive, or black, with large rectangular spots. Alternatively, they may lack spots and appear as one solid colour. All have a characteristic upturned snout that gives them their name. When threatened, Hog-nosed snakes flip over onto their backs to “play possum” by faking death. This act fools hungry predators into leaving the snake for scavengers. 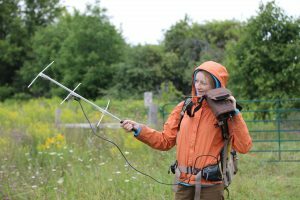 Radio telemetry is a useful wildlife research tool that allows the movement of animals to be tracked over time. We will be using radio telemetry as a way to track the movement of these snakes. 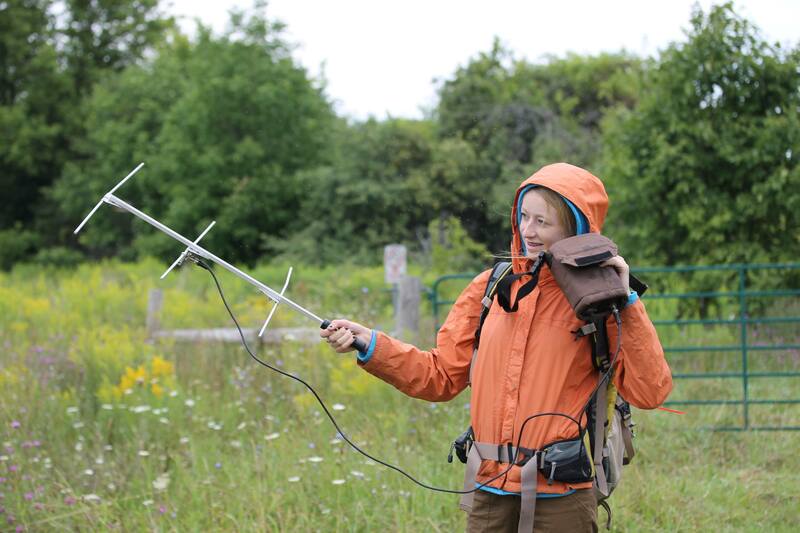 This method uses an antenna to detect a signal emitted by a transmitter implanted into each snake. We will also be conducting searches to better understand the size and distribution of the population. 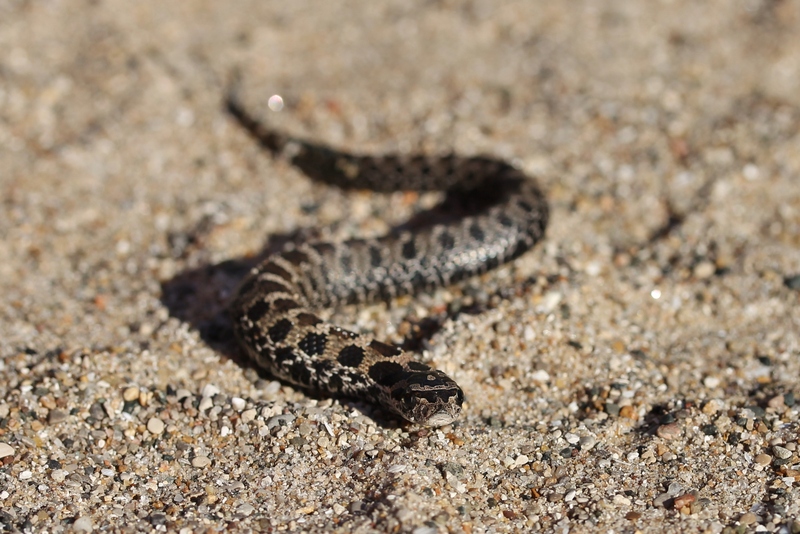 If you suspect that you have seen a Hog-nosed Snake, please contact Rachel at rachel@huronstewardship.ca. You can also report your sighting to the Ontario Reptile and Amphibian Atlas.